I-T-E 3P 30A Twin 240V Fusible Panelboard Switch with Bus Connection Hardware. Reconditioned with One Year Warranty. Dim 5"H X 17" W. Use Edison Type ECNR 250V RK5 Fuses. I-T-E 3P 60A Twin 240V Fusible Panelboard Switch with Bus Connection Hardware. Reconditioned with One Year Warranty. Dim 5"H X 17" W. Use Edison Type ECNR 250V RK5 Fuses. I-T-E 3P 100A Twin 240V Fusible Panelboard Switch with Bus Connection Hardware. Reconditioned with One Year Warranty. Dim 7-1/2"H X 17" W. Use Edison Type ECNR 250V RK5 Fuses. 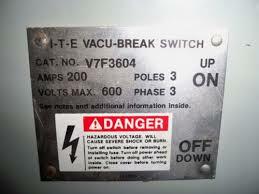 I-T-E 3P 60/100A Twin 240V Fusible Panelboard Switch only. No bus connection hardware included Reconditioned with One Year Warranty. Dim 7-1/2"H X 17" W. Use Edison Type ECNR 250V RK5 Fuses. I-T-E 3P 100A Single 240V Fusible Panelboard Switch with Bus Connection Hardware. Reconditioned with One Year Warranty. Dim 7-1/2"H X 17" W. Use Edison Type ECNR 250V RK5 Fuses. I-T-E 3P 30A Twin 600V Fusible Panelboard Switch with Bus Connection Hardware. Reconditioned with One Year Warranty. Dim 7-1/2"H X 17" W. Use Edison Type ECSR 600V RK5 Fuses. I-T-E 3P 30/60A Twin 600V Fusible Panelboard Switch with Bus Connection Hardware. Reconditioned with One Year Warranty. Dim 7-1/2"H X 17" W. Use Edison Type ECSR 600V RK5 Fuses. I-T-E 3P 60A Twin 600V Fusible Panelboard Switch with Bus Connection Hardware. Reconditioned with One Year Warranty. Dim 7-1/2"H X 17" W. Use Edison Type ECSR 600V RK5 Fuses.